Eczema is the most common paediatric skin disease prevalent in 15-20% children globally and 30% of Hong Kong children. The disease impact is long-term and multi-dimensional, affecting child development, parent’s well-being and the parent-child relationship. 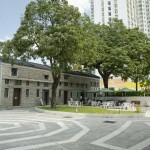 However, the psychosocial impacts and associated needs are often understated by the community. 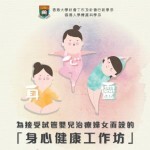 In this light, as initiated by the Department of Social Work and Social Administration of the University of Hong Kong (HKU) and collaborated by the Boys’ & Girls’ Clubs Association of Hong Kong (BGCA) and The Hong Kong Society for Rehabilitation (HKSR), a waitlist controlled study on the efficacy of psychosocial intervention program for parents and children with eczema will be conducted. The program, “Seeing the Invisible”, is the first non-pharmaceutical intervention program, adopting parallel group modality, which aims to promote awareness and enhance the holistic well-being for parents and enhance the self-esteem, emotional coping and resilience of children in dealing with eczema, as well as facilitate better parent-child relationship in spite of their eczema experience. In a pilot study conducted in 2016 with 27 pairs of parent-child dyad, results demonstrated that significant improvement in psychological and spiritual well-being of parents was found. Significant improvements in Leisure and Treatment Domain of the Children’s Dermatology Life Quality Index were also found among children participants, indicating that the children’s leisure and treatment aspects were less being affected after the group intervention (table 1 and 2). 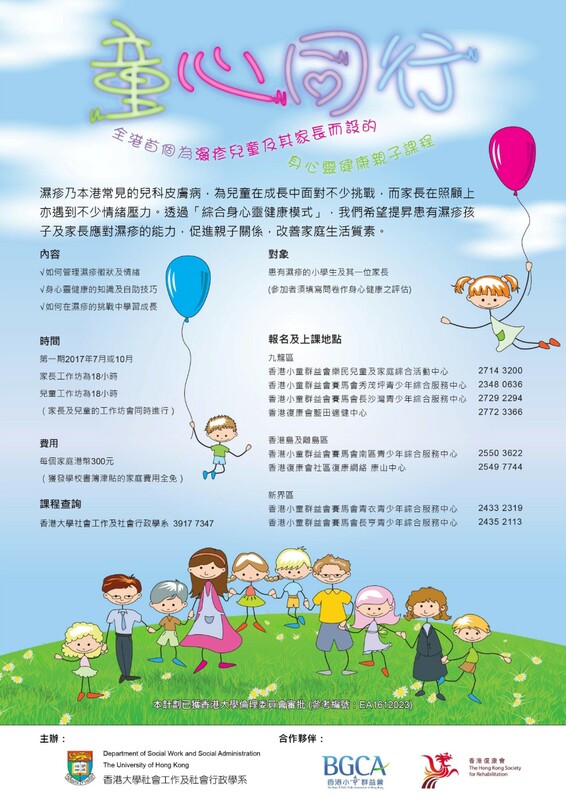 Prevalent in 15-20% children globally and 30% of Hong Kong children, eczema is estimated to be affecting more than 160,000 children (from age 0 to 14) in Hong Kong. Previous research suggested that eczema is more common in the Chinese population and long coastal areas with high relative humidity, which triggers severe seasonal outburst. 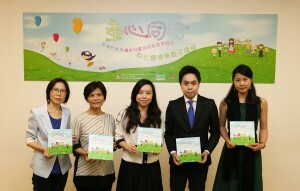 Local studies found 31.3% of primary and secondary students have been diagnosed of one or more skin diseases including eczema, whilst eczema was the top skin problem by 60% of the children in Hong Kong. Extensive research showed that the adverse effect of eczema in the children’s quality of life, including sleep disturbances from the itching and soreness, daytime tiredness, social stigmatization, diminished self-esteem, emotional distress, irritability and mood disturbance. Few suicidal cases involving patients suffering from long-term eczema patients had been reported in recent years, raising public concern over the disabling impacts of the disease. At school, children with eczema frequently experience others’ criticisms about their physical appearance, social isolation, social bullying, which may lead to loss of confidence, mood changes and depression. For younger children who have difficulties in expressing their needs and frustrations, they might display temper tantrums and meltdowns which further distant themselves from peers or become bullied. Lack of satisfying peers and family relation often continues affecting their interpersonal relationship and social functioning until adulthood. Drawings from children with eczema revealed that they were emotionally and socially disturbed by their physical appearance. They might experience lower self-esteem, social isolation, social bullying and social discrimination. Taking care of a child with moderate to severe eczema involves compliance with a rigorous skin treatment regime, adjustments to family lifestyle, and financial and social costs, which all can place substantial demands on the caregivers. Compared with other chronic illnesses, research indicated that parents of children with eczema experienced higher level of stress and depression, greater sleep disturbance, disruption of daily routines, poorer health, unstable emotions, reduced social activities and decreased quality of life. Given the unpredictability of flares and chronicity of disease course, eczema has shown to have greater impacts in lower income families whose access to public health care services is limited. Copyright © 2017 The Department of Social Work and Social Administration, The University of Hong Kong.